1. Autumn is the time when hedgehogs will prepare for hibernation – look out for the underweight hedgehogs and offer them food and warmth. 2. Hedgehogs can supplement their natural diet of insects with wet dog/cat food and cat biscuits if you come across one who looks to need a bit of fattening up. 3. Put out a bowl of fresh water, hedgehogs can move their nests from one area to another throughout their hibernation and would benefit from rehydrating. Don’t give them milk!! 4. Try not to use slug pellets/pesticides in your garden as these are harmful to hedgehogs. 5. 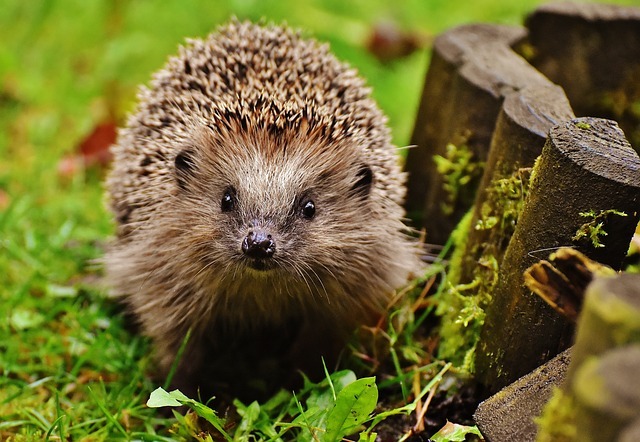 If possible, leave an area of your garden to grow wild – hedgehogs love to nest amongst brambles, log piles and leaves and this also provides a good source of insects for them to munch on. 6. Strim your garden hedges carefully. Hedgehogs have a habit of hiding amongst hedges and long grass and their spines are no match for a lawnmower! 7. Hedgehogs can naturally swim but they will drown if they can’t get out of the water source so ensure you have some netting/wire around the sides of ponds to make it easier for them to get out, should they fall in. 8. Hedgehogs need to stay warm whilst hibernating. Providing an area with decaying wood, leaves and straw will help with this. 9. Remember hedgehogs carry fleas! If you own pets then ensure you keep up to date with worm and flea treatment to ensure you’re spiny friends don’t share their critters with your furry friends. 10. If you see an injured hedgehog then take him along to your nearest veterinary practice or call your local hedgehog rescue centre. The BPHS can put you in touch with your local centre – 01584 890 801. Always ensure you pick up hedgehogs using a towel and transport them in a cat carrier/cardboard box, put in a hot water bottle and towel to keep him warm during transport.